Gabriel Moss is a writer, storyteller, and the creator of Gluten Free VR. He’s also a champion for VR fitness and has found that playing active gaming titles with his Oculus Rift has helped him become more active, confident, and has lost weight because of it! Keep reading to find out more about Gabriel’s VR-fueled health and fitness mission. VRFI: What sparked your interest in VR and what motivated you to purchase the Oculus Rift over other headsets? GM: Ever since I was little, I’ve been a massive gamer. I used to dream about how cool it would be to be inside of a game. Where instead of leveling up a character on a screen, my real-life skills would level up. I got my wish much earlier than I expected, and after seeing the fabulous Oculus Rift ad from Space Camp I justified the purchase to myself. 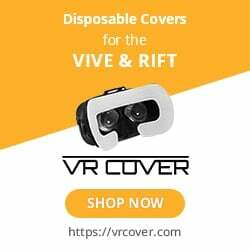 VRFI: Have you dropped clothing sizes, lost weight, feel or have become healthier since using VR? GM: In mid-October 2017, when I picked up the Rift, I weighed 210 lbs. This week, I’m fluctuating between 178 and 180 lbs. Before, my clothes would be far too tight for me. Now, they fit perfectly. VRFI: That’s awesome, congrats on the weight loss and better fitting clothes! VRFI: Do you have a healthy eating plan, do additional cardio, or do weight/resistance training outside of VR? GM: Hah! Unfortunately, I think my eating plan has actually gotten worse since I started exercising in VR. I think it’s from the confidence I get from the intensity of the workouts. Because it’s getting nicer outside now, I’m spending at least an hour per day taking walks and runs around my neighborhood. Generally, I’ll cover 3 miles on foot in addition to the VR workout. Every so often, I go dancing at one of the local Portland nightclubs with friends — an activity that burns 700-800 calories over 4 hours. VRFI: Which games do you like the most for fitness, coordination, and fun? Are there any games that you played that were surprisingly active? GM: The thing about VR is how every game teaches fitness and coordination in some way. I like to play Onward, a popular mil-sim (military simulator) for VR, and it’s vastly improved my hand-eye coordination. Same with Echo Arena and Sparc, which both require me to build my arm strength and dexterity to compete with other players. I didn’t expect Space Pirate Trainer or SUPERHOT VR to have any exercise benefit at first, but I ran some tests with my Apple Watch and both games are capable for raising my heart BPM to 155. When it comes to getting a real workout in under an hour, you really can’t beat The Thrill of the Fight! and BOXVR. Both games have pushed my heart rate upwards of 195 at peak engagement. VRFI: As a marketing ghostwriter with a desk job, you say that “With VR, I can be in the same room that I do my work in, and I can teleport to my gym without needing to commute.” Do you think that virtual gyms are where the fitness industry is headed? GM: Absolutely. If you run a home business or freelance like I do, getting out of the house can be a chore during crunch-time. You have to think about why people go to gyms: Because it’s boring to exercise alone. You could theoretically make an empty hotel room into a gym if you wanted to; after all, you’re equipped with everything you need to do pushups and wall-sits. But people pay top dollar for exercise equipment, programs, and group classes because they want the full experience. They want to be engaged. I think that VR accomplishes this even better than a gym or a group class does because it goes the next step — it makes you forget that you’re getting exercise. VRFI: Do you play games or exercise in VR with friends or players online? Which multiplayer games do you like to play or program do you use? GM: I don’t typically see anybody else online in BOXVR at the same time as me, so I do my workouts alone. When I discreetly want to relax and have fun in multiplayer, I log into Echo Arena or Onward and join a match. If I want to watch a movie or TV show, I’ll load it into BigScreen and invite a few friends to join me for a screening night. VRFI: Since you sit frequently for work, which VR games would you recommend for leg day? GM: BOXVR is the only game that I’ve encountered, so far, that makes me do squats. And I actually think it makes me do more squats than my old HIIT instructor. So that’s my leg day game. VRFI: Is there a VR fitness game or experience that you’d like to see made for virtual reality that hasn’t been created yet? GM: Yes! I want an online variant of The Thrill of the Fight!, and I’ve even talked to Ian Fitz about this on Steam; he’s basically said no to it at this point. Though, he’s entertained the idea of doing a sequel which would theoretically ship with multiplayer. Generally, that kind of thing is difficult for a single indie developer to put together. VRFI: That’s a great idea that sounds like it could become an esport or competitive game like what VR League is doing. VRFI: What are your hopes for 2018 and the future of the VR, AR, MR, or XR industry? GM: I’m launching glutenfreevr.com (GFVR) this June, which will function as a blog in the VR space. I’m planning to move 100% of my business efforts into GFVR as the year progresses. The reason that I’m going this route is that I really believe in VR as an industry. I think that more people will open up to the possibilities of this platform and see how it can transform their lives for the better once they start getting their hands on 6 degrees of freedom (6DOF) headsets and haptics controls. For one, it solves the problem of sedentary living. People will start getting more fit, en masse, once being a gamer starts being connotative with being an athlete. It’s also one of the most powerful meditative tools I’ve ever used. When the technology matures and the representation of in-app avatars gets a major fidelity boost, it can become one of the technologies (along with AR) that re-educates people on the social skills that have been lost with the advent of the smartphone and social media. VRFI: Thanks for chatting with us, Gabriel!